Check this page when you visit for the most up to date changes and for featured content. Kudos to Bonnie Blackburn, presenting Expansion Joint Essentials in an FCCU, at the AFPM Cat Cracker Seminar in Houston on Wednesday, August 24. This was a great opportunity to present more fundamental information to emerging engineers as they also networked with experienced engineers. Bonnie did a great job showcasing Pathway’s collective knowledge and experience in this space, as she illustrated the importance of Expansion Joints in an FCCU, fundamental facts about them, as well as red flags to be aware of when working with FCCU joints. Would you like Pathway to present at your facility or event? Get in Touch! 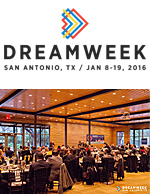 Senior Flexonics Pathway was proud to become a part of DreamWeek in January 2016. DreamWeek is a 12 day celebration of events that fosters the exchange of ideas on universal issues in order to promote tolerance, equality,and diversity. The goal of DreamWeek is to bring people of all cultures, creeds, and disciplines together to exchange ideas, inspire discussion, and ignite a positive change for the greater human experience. The EJMA Standards are recognized throughout the world as the authority on the proper selection and application of metallic bellows type expansion joints for safe and reliable piping and vessel installation. The Tenth Edition standards combine the knowledge and experience of the leading manufacturers of expansion joints into an invaluable reference document. To order your copy with both print and ebook versions, go here. Having a solid, reliable piping system is based on many factors. Comprehensive knowledge of all its components is extremely important. In our new webinar series, we’ll introduce movement types, nomenclatures and finish this installment with a look at Pressure Thrust. Installments 2 and 3 cover Types of Restrained Expansion Joints, and Unrestrained Expansion Joints. All industries use their own lingo and we are no exception, understanding the terminology and nuances can be challenging. This webinar explains in layman’s terms the technical portion of our quotations. It overviews the effects on the system of expansion joints including; pressure thrust, spring forces and the various stresses which govern industry best practices. Whether you are a first timer or a seasoned pro there is something in this webinar for you. Join us as we go into detail about the makeup of these units, their function in a plant and what you need to know for their maintenance and reliable performance. View the video here. It’s not often that we have gotten the opportunity to analyze a fabric expansion joint that has been in service for 18 Years. What did we learn from testing fabric that had been in service for so long a coal fired power plant? Join us as we look at the results, with the help of Saint-Gobain. This webinar, which aired August 19, covered the current state of the art of Guillotine Dampers; rack and pinion drive systems, the Flex-Seat seal configurations and the advantages of enclosed bonnets. View it here. This webinar, which aired July 15th, covered the most commonly failure modes of bellows and what you can do to add years to the life of your expansion joints. We will also cover design and manufacturing deficiencies and what should be rejected to avoid premature failure. This webinar is a must see for anyone involved with specifying, procuring or inspecting metal expansion joints. View it here. Now you can view isometric renderings in a PDF format. You can click and hold with your mouse button to rotate the part you see. You can spin it, and move it in almost any direction. You can also use the scroll wheel on your mouse to zoom in and zoom out. This is a desktop browser only feature. A two ply bellows element should be ­routinely tested to confirm that both the inner and outer plys are operating properly. We’ve put together a convenient, durable kit to test your 2 ply bellows. Our third Webinar aired in May, it is available for viewing on our Videos page. Diverter Dampers have a very specialized function. Our expert will go into detail about the function of a diverter damper and their features and benefits. As these units function in extreme conditions, suggested maintenance for the diverter damper will also be covered. We’ve uploaded instructions for the installation for Metal and Fabric Expansion Joints. We’ll be adding other information and resources for our products to this page. Have any questions about any of the procedures? Be sure to Ask one of our Experts. Our second webinar officially played from April 15th-17th, we have now made it available for you to watch on our new Videos page. Our expert will explain the importance of a crossover in a facility and what happens during a complete refurbishment, and why. Have any questions about the procedure? Be sure to Ask one of our Experts. The two companies have joined forces to provide a total solution to customers around the world. Meetings were held with key players in the Power and Petrochemical sectors. This successful visit to Brazil followed an earlier one to Saudi Arabia. Now that our first webinar officially played from March 18th-20th, we have now made it available for you to watch on our new Videos page. Follow along with our expert as he explains why you should test your 2 ply bellows, how to complete the test and the equipment you need for the test. We’ve also included a PDF that details the procedure. Have any questions about the procedure? Be sure to Ask one of our Experts.